30.10.2015 (Hvino News). The latest issue of ICCommerce features the article about Georgian wine Usakhelouri, which was contributed by Hvino.com. The article, entitled Say “Oosa-Hello-Oory”: Georgia’s most precious wine on its way to global recognition, traces the intriguing story of one of Georgia's rarest and most expensive wines - since the Stalin's epoch, when it was exclusively produced for the government in Kremlin, till its re-birth nowadays thanks to the enthusiasts' efforts. The article includes comments by Giorgi Samanishvili, director of National Wine Agency. The full text of article in English on Usakhelouri wine is reposted by Hvino News here. The Georgian translation can be found here. The original magazine article in both languages as PDF file can be downloaded here. 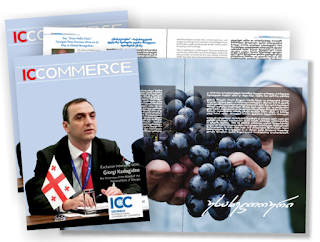 The full ICCommerce Edition V can be downloaded here, as PDF file. The officers of Stalin’s secret police actually counted the amount of Usakhelouri wine produced, and made sure the peasants did not retain a drop of precious product for personal use. It’s small wonder that almost nobody knew about this rare wine, and even fewer had ever tasted it. 29.10.2015. While visiting a supermarket in Tbilisi, a business traveler or a tourist can rarely miss the wine department. Usually, it is the liveliest spot of every shopping center, with some action taking place all the time. Surrounded by other departments’ lonely and ordinary-looking shelves, the wine place is the one, which is inhabited - by promoters. They are usually charming girls in colorful national costumes, who welcome you and offer free wine tasting. Yes, they are promoting their products but they are acting in such a delicate and friendly way, that you feel they just want to make your life better. The lucky traveler is offered a pretty amazing choice of wines to try, which are generously poured into full-size glasses (not microscopic plastic thimbles used for promotions elsewhere in the world). Easily and without any pressure, after one or two sips, you realize you are in a country where wine indeed plays a very special role. After several visits paid to such wine departments, a typical foreigner may become perfectly aware of various brands of Kindzmarauli, Rkatsiteli, Mtsvane and dozens of other hard-to-pronounce but delicious Georgian wines – without spending a dime. But there is one wine, which is never offered for free, and for a good reason. It’s the Usakhelouri (here is how to pronounce: Oosa-hello-oory), dark red semisweet wine made of one of the most rare of Georgia’s whopping 400 grape varieties. Usakhelouri wines are expensive, hard-to-find in Georgia and almost completely unavailable abroad. Because of its rarity and high price, this wine is little known even among Georgians themselves. Usually bottled in elegant, slender non-standard glassware, Usakhelauri stands in solemn solitude on a remote shelf of the wine department, far above all the fuss of daily promotions, fenced by its price tag from the casual shopper, waiting for the right connoisseur. I find it rather pointless to describe the taste of wine in writing. If you are lucky to be reading this in Georgia, you may invest in a bottle of Usakhelouri and taste it yourself in a company of friends (Yes, the price is rather high for a Georgian wine but still is comparable to the cost of a good dinner in a restaurant, so it is not unaffordable.) If you are outside of the country, but still are familiar of Georgian wines, just remember the best Khvanchkara you have tried - not too sweet one – and imagine something much more fresh, rich and elegant. If you like this idea, maybe you’ve just got another serious reason for paying a visit to Georgia. 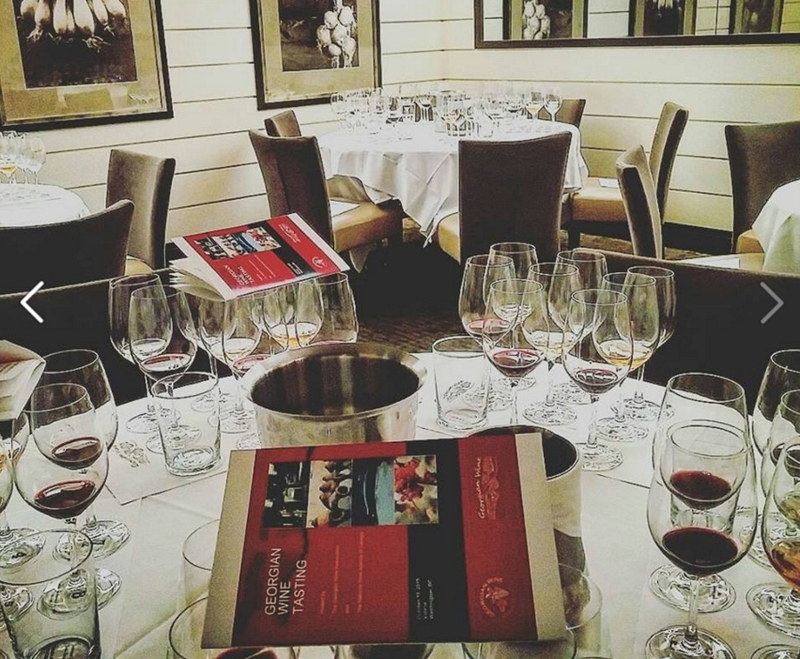 An introduction to Georgian wine in Washington, D.C.
26.10.2015. Rkatsiteli, kisi, saperavi, ojaleshi. You might not have heard of them, but they’re already listed on some of the trendiest wine lists in town, from Compass Rose to Red Hen. They’re Georgian wines and they’re worth seeking out. Georgia may well be the birthplace of wine. Evidence shows that people living near the Caucasus Mountains have been fermenting grapes into wine for approximately 8,000 years, longer than anywhere else on the planet. Families all over Georgia maintain their own small vineyards and make wine at home, downing hundreds of liters a year at feasts celebrating everything from births and weddings to birthdays and appliance purchases. 25.10.2015 (Hvino News). 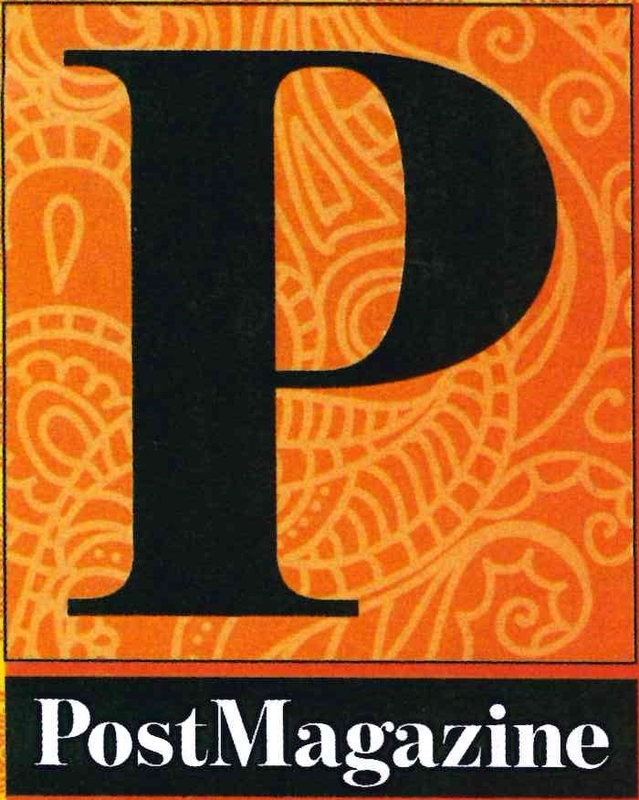 Post Magazine, a popular Hong Kong's lifestyle magazine published by South China Morning Post, has published an article on Georgian wines. The article by Sarah Wong is entitled "Three wines from Georgia, a country with an 8,000-year wine history". She writes: "Search for Georgia online and you'll find far more references to the American state than to the country. Many oenophiles aren't even aware that wine is made in Georgia (the country, not the state) but, for experts, it's an exciting region that is well worth exploring." The author quoted Eko Glonti, of the Lagvinari winery ▼Map , saying "Georgians do not make wine. They give birth to the wine. A wine is like a person. It is born, lives and dies." Article in Post Magazine focuses on Georgia's white varieties rkatsiteli and kisi, noting that "White wines made using qvevri undergo an entire change in character. Their colour deepens to a golden hue, which is why they are known as amber wines. On the nose, they may have honey, apricot and dried orange peel notes. Their palate is surprisingly powerful and full - these are wines that benefit from time and conversation. Firm tannins make them ideal food wines that will pair well with white meat." 24.10.2015 (Hvino News). 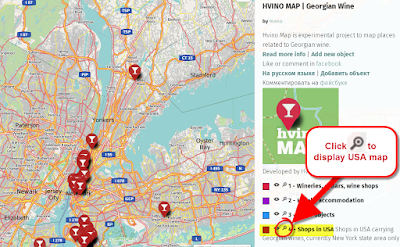 Three weeks ago, on Georgian Wine Day, Hvino kickstarted Hvino Map - our interactive Georgian wine mapping project. Thanks to weekly updates, Hvino Map has already doubled the number of objects it displays. Many thanks go to our readers for submitting information and adding value to the map in real time! Hvino Map was conceived to cover primarily the territory of Georgia. But today the map is going international. The latest update, uploaded today, includes the first portion of objects located outside of the Georgian borders. They are shops and bars in the USA, which carry Georgian wines. The first selection of Georgian wine places covers over 30 locations across the New York state; other U.S. states are to follow, with the next map's updates. View the updated map at this link. By default, Hvino Map displays objects in Georgia, of course. The picture shows how to display objects in USA: Mover cursor to "Shops in USA" Layer, and click on the magnifying glass symbol. Mapping Georgian wine locations outside Georgia is important, because Georgian wine is gaining popularity in many countries, including the USA, and more people need to know where they can buy it. 22.10.2015 (Hvino News). In most countries, the set of most respected and prestigious professions is pretty much similar. Commonly, it includes doctors, lawyers, bankers. Georgia stands out of the usual pattern. Winemaker in Georgia seems to be much more prestigious profession than anywhere else on Earth. I know several lawyers and at least two doctors who became prominent winemakers in Georgia. And there are also several professional engineers, artists and at least one sculptor, who gladly traded their hardly-earned professions for wine-making. When I came to visit Telavi Wine Cellar, one of Georgia’s largest wine producers (under "Marani" brand), I had the feeling I was in a private Swiss medical clinic. Combination of beautiful mountain views, fresh air, and shining steel equipment helped to produce this first impression. In course of conversation with Zurab Ramazashvili – the company’s head – he told me he is an experienced otolaryngologist (a doctor specializing in ear, nose, throat disorders). That’s when I started to see his business from a different viewpoint. 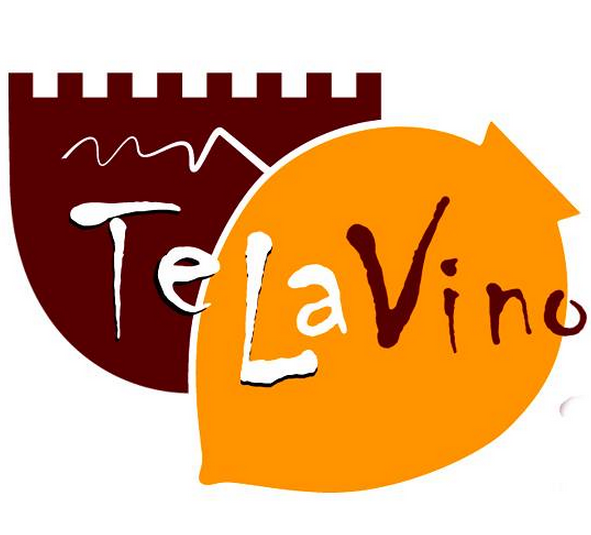 Founded in 1915, Telavi Wine Cellar is located just outside the city of Telavi ▼Map . Its elegantly restored historical building with a private rose garden and a small fountain is surrounded by vineyards, which seem endless. In fact, company’s vineyards occupy about 450 hectares in Kakheti, Georgia’s main winemaking region. Inside the office building, a wall at the meeting room is dedicated to awards won by the company, including the most renowned Decanter and Mundus Vini diplomas. 22.10.2015 (Hvino News). To celebrate 40 years of Decanter, the famous British wine magazine asked its experts and contributors to chose their favorite wine of 2015. 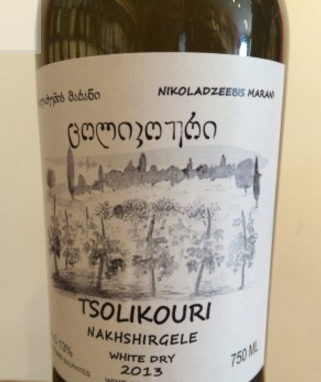 According to official website, the prestigious list includes a wine from Georgia: Tsolikouri Nakhshirgele 2013 from Imereti, produced by Nikoladzeebis Marani. "I love wines that make you question the status quo. This beautiful, amber-coloured white is made – as many of Georgia’s best wines are – in qvevri (large traditional clay vessels buried in the ground). Ramaz Nikoladze produces it from 100-year-old Tsolikouri vines in the Imereti hills of central Georgia, with three months of stem-free skin contact. The wine’s exotic notes of spice, apricots and tea ride with exciting energy to a finely tannic, elegant finale and go just wonderfully with foo. Drink 2015-2017." Ramaz Nikoladze's Tsolikouri and other chosen wines will become a part of Decanter’s 40th anniversary celebrations. 21.10.2015. On October 19th was the final Georgian wine tasting, ending in Washington [read more: United States marks October as Georgian wine month - HN] . About 60 wine enthusiasts attended the tasting and everyone appeared to have an enjoyable wine tasting with tasty appetizers. The day was chilly but sunny in the District of Columbia, as we found our way to Vidalia Restaurant close to Dupont Circle. It did not take long to walk several blocks. We walked past the White House as our house guest, Tamta from the National Wine Agency, wanted to see the White House since this was her first visit to Washington. After several more blocks we arrived at Vidalia Restaurant. The facility is located on the lower level and is divided into several rooms. The rooms are decorated with a comfortable but sophisticated atmosphere. The first part of the wine tasting was a seminar led by Lisa Granik MW, a Georgian wine enthusiast. Lisa described the Georgian wine industry and touched on its history and how grapevines were used to help spread Christianity across the land. Her presentation included mention of qvevris and terroir. She said, “Wine is so much a part of Georgian life.” Another comment was “Vines grow like ivy.” Lisa followed this up by guiding us through a tasting of several Georgian wines. Possibly the best QPR wines in the world today? 18.10.2015. Today, I want to talk about wine and value. “Value” has an interesting meaning in the world of wine – may be as subjective as the concept of a “good wine” itself. To me, the value is not an absolute amount of money one paid for the bottle of wine – if you paid $3, but poured the bottle down the drain after half-finished first sip because it tasted terribly – was that still a “value”? Or was that a pure waste of money? By the same token, if the $20 bottle of wine gave you lots of pleasure in every tiniest drop (including the one you licked of the table), would that be a “good value”? Talking about the “value” of the wine, I prefer to use a proverbial term QPR, so happily adapted by the wine lovers – a Quality Price Ratio (this is what QPR stands for) conveys the “value” concept of wine a lot better than the sheer price itself. “Knowing what I know now”, the region which I think consistently delivers the best QPR at the moment (!) is Georgia – not the state down south in the US, of course, but an independent country. I always loved Georgian wines, but what prompted this broad statement about QPR was a recent Georgian wine tasting I attended a week ago at Chelsea Market in New York. Wine after wine was delicious, and priced under $20 – that is a QPR I’m definitely happy about. 17.10.2015. The streets of Old Tbilisi are alive this weekend for a two-day event celebrating one of the country’s most colorful and spectacular festivals – Tbilisoba, the celebration of the diversity and history of Georgia's capital city. One of the most enjoyable events of the festival will be Wine Parade, and exhibition/sale of traditional Georgian wine, followed by Tea and Honey Festival later today.Visitors will also have an opportunity to taste different dishes from international cuisines at the Culinary Festival at the Rike Park. 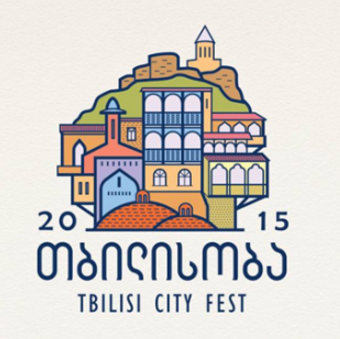 Tbilisi City Fest is an annual celebration, which is favored not only by citizens of Tbilisi and Georgia, but also is frequently visited by international guests and tourists, who specially plan their trip on those dates. Below is an agenda of some of the most interesting activities that will take place in Tbilisi today and tomorrow, which locals and guests were advised not to miss. 15.10.2015. We hope tens of millions of Georgian wine bottles will be exported to China very soon, - Minister of Agriculture Otar Danelia has told reporters at the Radisson hotel where a conference on China-Georgia economic ties and trade is underway. 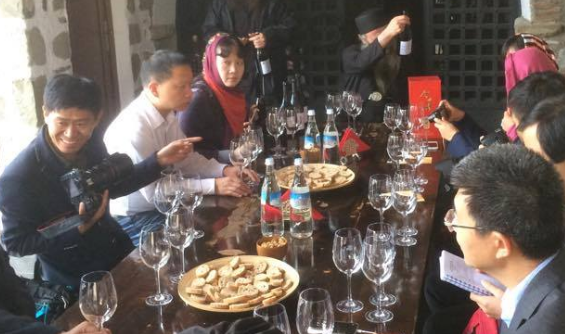 According to the minister, tens of reporters were in Georgia to promote Georgian wine in People’s Republic of China. “We had many visitors. Several of them are still here including tens of reporters working to popularize Georgian wine in People’s Republic of China. About a billion and a half people saw videos about Georgian wine. The latter is becoming more and more popular. We hope tens of millions of Georgian wine bottles will be exported to China very soon,” Otar Danelia remarked. 14.10.2015 (Hvino News). 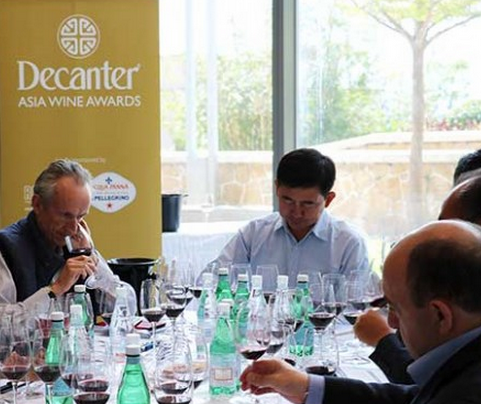 The 2015 Decanter Asia Wine Awards (DAWA) results were officially announced. 29 Georgian wines have been awarded in this year's competition. Last year, only one Georgian wine was awarded (Shumi's Kindzmarauli Georgica) at DAWA. 14.10.2015 (Hvino News). Georgia's National Wine Agency reported that vintage in Racha (West Georgia) is going as scheduled. As of October 13, 400 tons of grapes have been harvested and processed in the region of Racha-Lechkhumi, including 392 tons of Aleksandreuli and Mujuretuli varieties, which are used for production of well-known Khvanchkara semi-sweet red wine. 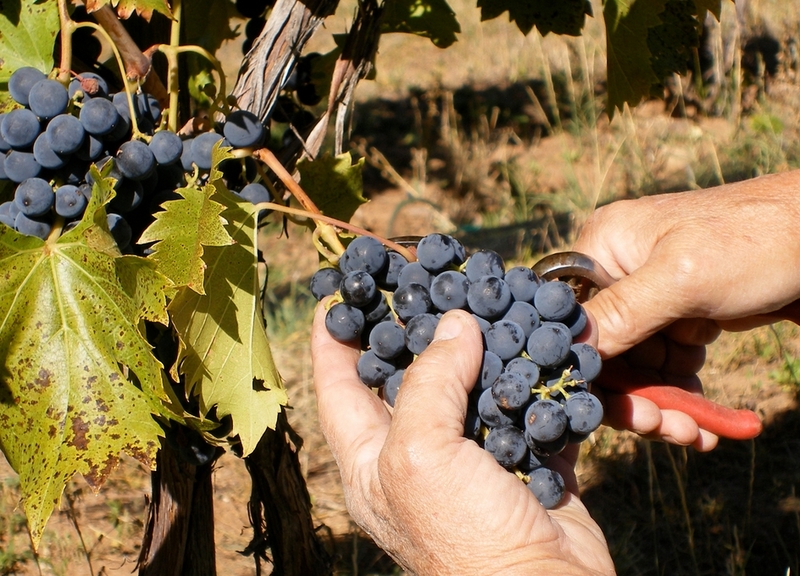 Up to 900 local winegrowers provided their crops. The farmers' revenues reached GEL 2 million. Like in Kakheti, the government kept promise so the Racha farmers didn’t face the problem with sales, as the state will process all the excess grapes which will not be purchased by private companies. Promises regarding prices also remain valid: the state will pay 5 GEL per 1 kg of conditioned mujuretuli and aleksandreuli, for non-conditioned with a sugar content of less than 21 degrees – 3 GEL, while for the other grapes – 0,7 GEL. Vintage is coming to an end in Kakheti (East Georgia), where 133 thousand tons of grapes have been processed. Income of farmers exceeded GEL 90 million. 14.10.2015. “America’s New Hot Wine,” blared a Washington Post headline. “Older and Wiser,” counsels the venerable Financial Times. “The next big food and wine destination,” offers Mashable, the beating heart of the web 2.0 zeitgeist. For Georgia and its ancient winemaking tradition, the plaudits have recently come thick and fast. And for good reason: Georgian wine is generally superb. The country boasts an embarrassing bounty of unique native grape varietals, and ancient methods that continue to confound and delight the winemaking world. And in Georgian wine, geopolitically aware connoisseurs are offered a fine pairing for their onglet a l'échalote (for me, I recommend the dark, fierce depth of the saperavi varietal) that doubles as a kind of repudiation of Russian militarism, while giving nods to a steadfast and dependable Western friend. But Georgia’s wine is about far more than rich tastes or a convenient reflection of a simmering contemporary conflict. Georgia’s relationship with wine is deeply, nearly indescribably old and admixed into the very core of its culture. And it’s that ancient heritage and long history that imbue it with geopolitical significance even today. 13.10.2015. Georgian wine is gaining popularity and making an impression in Japan. Georgian National Wine Agency reported Japan was among the top ten export markets where Georgia exported its wine in 2014. Meanwhile as for this year, between January and July the amount of Georgian wine exported to Japan increased by 10 percent. In these seven months Georgia exported 90,194 bottles of wine to Japan. 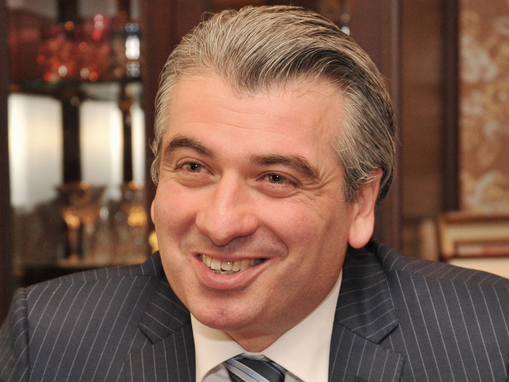 Georgia’s Ambassador to Japan Levan Tsintsadze thought the increasing number of Georgian wine tasting events, seminars and exhibitions played a key role in raising awareness of Georgian wine among Japanese consumers. 6 Georgian wine producers take part in Foodex Japan exhibition - HN] and Wine and Gourmet [read more: Georgia debuts at Wine and Gourmet Japan exhibition - HN], which are considered as some of the best methods for invading Asian market,” Tsintsadze told local news agency Newspress. In recent times Georgian wine was recognised among the best in the world at wine competitions held in Japan. Georgian wine won Diamond, Double Golden and Silver awards at the Sakura Japan Women Wine Awards and a Golden award at the Japan Wine Challenge. 12.10.2015 (Hvino News). According to the National Wine Agency, 120 thousand tons of grapes have been processed since the start of the harvest in Kakheti region. Revenues from the sale of the crop reached GEL 81 million. At the moment, 62 thousand tons of Rkatsiteli were processed, 41.2 thousand tons of Saperavi, 2.8 thousand tons of Kakhetian green and 12.3 thousand tons of other grapes. 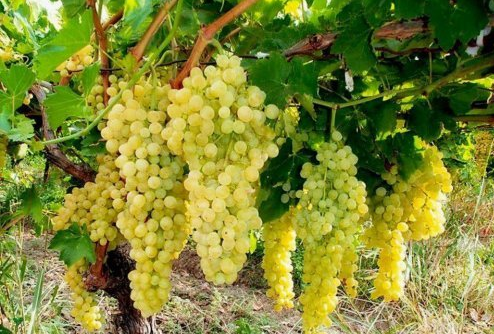 In Kakheti the grape processing by municipalities is as follows: Gurjaani - 39.7 thousand tons, Telavi - 27,8 thousand tons, Kvareli - 21.4 thousand tons, Sagarejo - 8,4 thousand tons, Signagi - 7,8 thousand tons, Lagodekhi - 7,8 thousand tons, Akhmeta - 4,2 thousand tons, and Dedoplistskaro - 2,2 thousand tons. Racha-Lechkhumi will join in the vintage soon. 11.10.2015. Georgia is diversifying its export markets and exporting more wine to strategically important markets such as China, France and the United States. Latest data from the Georgian National Wine Agency noted more than 24 million bottles of wine worth $66.8 million USD was exported to 41 countries in the first nine months of the year. This was a decrease year-on-year however several strategic markets had increased their imports of Georgian wine by 90 percent or more. The Agency said China was one of the most strategically important markets for Georgia, where wine exports had increased by 90 percent. Between January-September 2015 Georgia exported more than 1.5 million bottles of wine to China. The taste of Georgian wine was also being enjoyed all over the European Union. The Netherlands imported 146 percent more wine this year than in 2014, while Poland imported more than one million bottles. 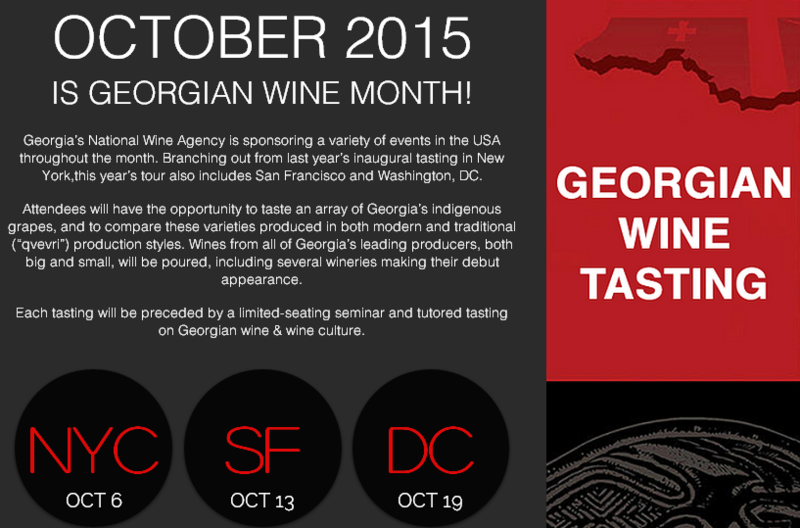 Georgia in Lonely Planet's "Ten world’s most intriguing wine regions"
09.10.2015. (Hvino News). 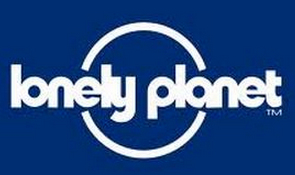 Travel guides publishing house Lonely Planet included Georgia in its recently published list "Ten of the world’s most intriguing wine regions". Lonely Planet’s new book Wine Trails plots a course through 52 of the world’s greatest wine regions, with weekend-long itineraries in each designed by expert writers, including wine buyers and sommeliers. 09.10.2015. (Hvino News). 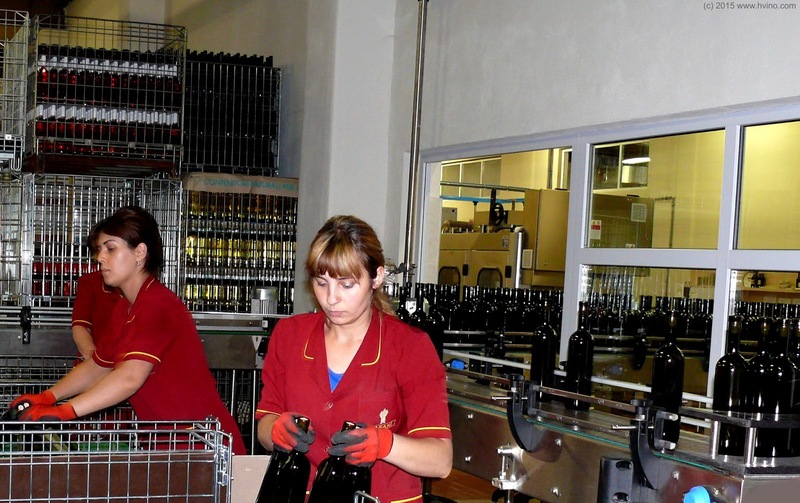 State-owned winery Gruzvinprom, located in Gurjaani (Eastern Georgia), was sold at auction for 31.105.000 GEL (about 13 million US$). 100% of the company was offered for privatization in September. Auction ended on October 7. The starting bid for Gruzvinprom amounted to 11 million GEL. The buyer is not currently known. The new owner must pay the full amount to the state until 2018. Gruzvinprom possesses land plot of 46.906 square meters in Gurjaani, at 1, Kostava Street, with 26 buildings. View location: ▼Map . The buyer is obliged within 2 years to invest no less than 1 million GEL into reconstruction of the plant towards production of alcoholic beverages and soft drinks. The buyer is expected from 2016 to 2019 to process annually at least 3000 tons of grapes. 09.10.2015. (Hvino News). October has been declared as Georgian wine month in the US. This month Georgia’s National Wine Agency is sponsoring a variety of events in the USA. Branching out from last year’s inaugural tasting in New York, this year’s tour also includes San Francisco and Washington, DC. Attendees of "Georgian Wine Month" will have the opportunity to taste an array of Georgia’s indigenous grapes, and to compare these varieties produced in both modern and traditional (“qvevri”) production styles. 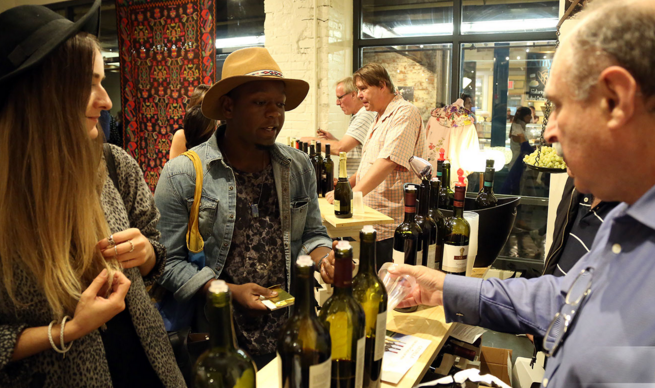 Wines from all of Georgia’s leading producers, both big and small, will be poured, including several wineries making their debut appearance. Each tasting will be preceded by a limited-seating seminar and tutored tasting on Georgian wine & wine culture. 08.10.2015. Artist Jonathan Wurdeman talks in long, precise sentences that can stretch to 10 minutes — passionate, focused and full of details. He wants everyone to understand the intertwining elements of Georgian culture — music, food and wine. It all started with a CD called “Georgian Folk Music Today.” Wurdeman found it while flipping through albums at Plan 9 Records when he was a teenager. He fell in love with the polyphonic folk music. While attending the Surikov Institute of Art in Moscow, first as an undergraduate and then as a graduate student, Wurdeman finally was able to visit Georgia, the country on the Baltic Sea [oops, shall we correct this? - HN]. His hosts welcomed him with a feast, lots of poetic toasts with local wine and music performed by the very same musicians on the album he bought so long ago. “I knew then that my connection with Georgia would not be a simple one,” he says. He moved to the country after graduating and thought he’d focus on music and painting. But the wine grabbed hold of his imagination in a way that he didn’t anticipate. 07.10.2015. 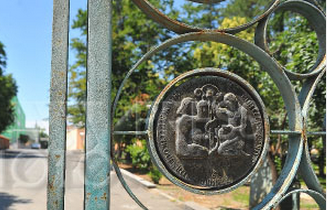 France may be Europe’s largest wine producer, but it is Georgia where wine was born. It is said that wine production started about 7,000 or even 8,000 years ago and archeological remains found in the area suggest that as early as 4000 BC grape juice was placed in underground clay jars or qvevri to ferment during the winter. Last August, 43 ancient qvevries dated back to the 11-13th centuries were discovered by archaeologists at Khikhani Fortress, Adjara, Western Georgia. In 2015, the World Bank spent over $1 million to enhance Georgia’s ancient Qvevri wine-making methods by establishing a Qvevri House in the eastern part of the country. That ancient traditional winemaking method was also added to the UNESCO Intangible Cultural Heritage Lists [read more: World Bank to enhance Georgia’s unique qvevri wine-making method]. Today, there are over 500 species of grape in Georgia, a greater diversity than anywhere else in the world, with around 40 of these grape varieties being used in commercial wine production. “Georgia’s wine choice is so wide it offers virtually everything a modern wine lover needs: unique grape varieties; modern-style classics; organic and bio-wines; trendy “orange” wines,” says Dr. Alexander Kaffka, Managing Director of Hvino.com, an English-language news portal about the Georgian wine industry. 07.10.2015. The Georgian wine industry had a couple of very good years in 2013 and 2014, following the opening of the Russian market. 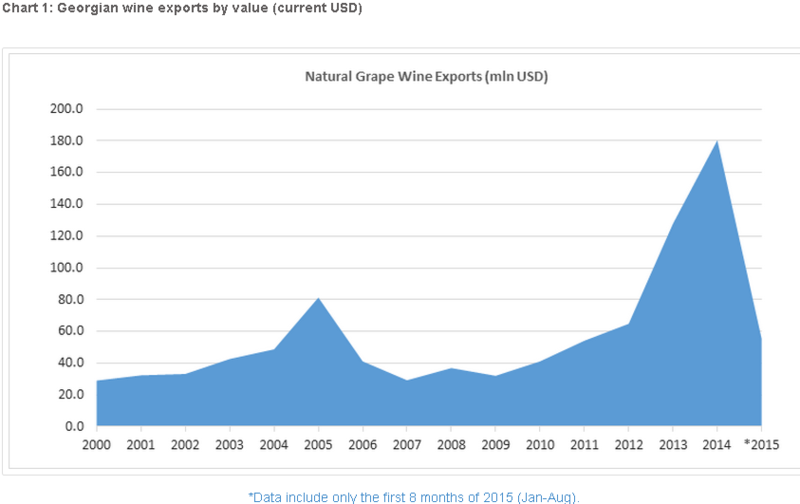 Exports skyrocketed, prices of grapes followed suit. For all the talk about diversification, within just two years, Russia’s share in the total exports of Georgian wine shot up from 0 to almost 68%. 06.10.2015. (Hvino News). 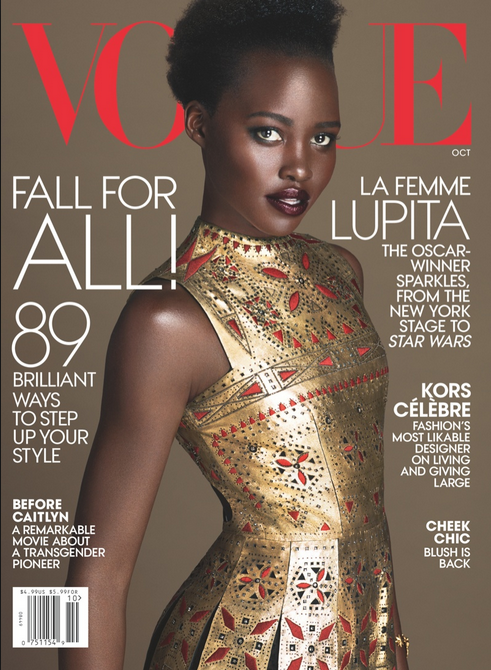 American Vogue magazine in its October's issue mentions the Georgian winemaker Iago Bitarishvili. His wine Iago's Chinuri is listed at the top of Vogue's list of orange wines. 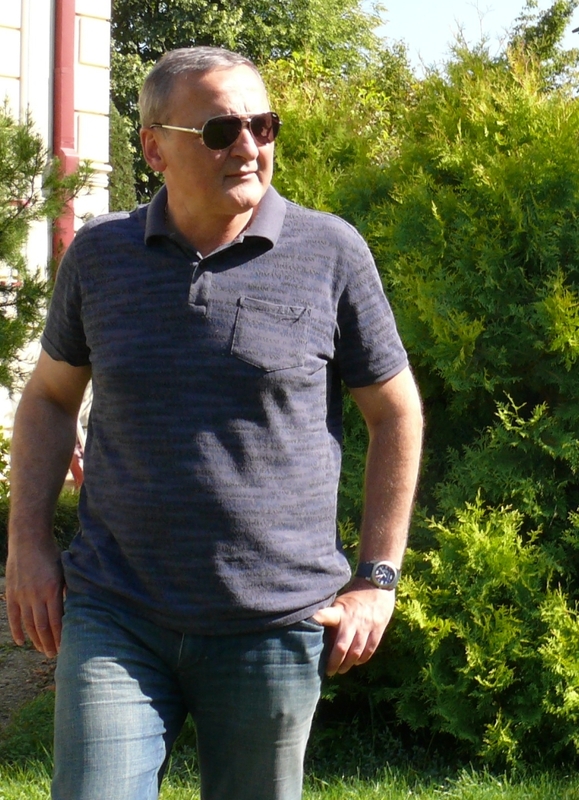 Iago Bitarishvili founded his winery in 2003 to realize his dream of making wine in the traditional homespun way of his region. So he crushes his organically grown chinuri grapes in a large, hollowed-out log and empties the resulting juice and skins into earthenware vessels called qvevri, which then remain buried in the ground for six months. It may sound like alchemy, but the result is a fascinating mouthful: pear, autumn honey, buckwheat, and eastern spices, with the structure of a red wine built for aging. Try it with hard cheeses and charcuterie or more substantial vegetarian fare like bitter greens and eggplant. 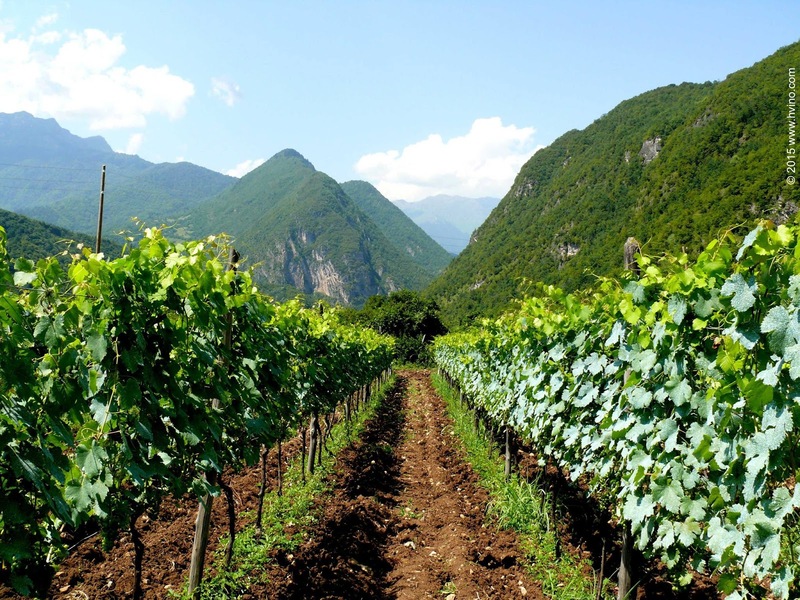 05.10.2015 (Hvino News) Georgian winemaker Ramaz Nikoladze is participating in Terra Madre Youth – We Feed The Planet, which, from October 3 to 6 in Milan (Italy), is bringing together all young people involved in the food chain: thousands of farmers, fishers, students, chefs, cheesemakers and activists from around the world. Straddling Europe and Asia, Georgia was one of the first places where the grapevine was domesticated. A historic wine-producing country, it is home not only to dozens of native varieties, but also a fascinating way of preserving wine. 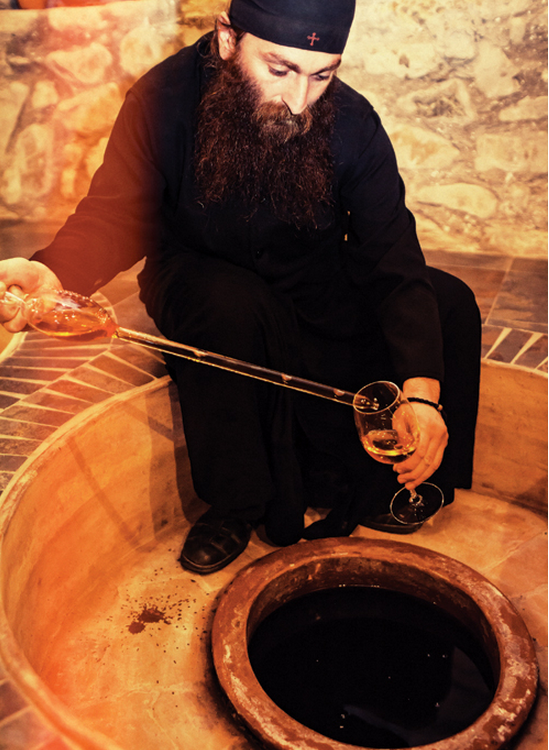 In the village of Nakhshirgele, Ramaz Nikoladze, driven by hope and passion, makes a very special wine from the grapes of his small vineyard. Like his father before him, he produces wine in amphorae, using a vinification technique typical of the country. On his hectare and a half of land, Ramaz, now in his forties, grows two native grape varieties, tsiska and tsolikauri. Watching him work with his amphorae, called qvevri in the local language, is indeed like watching a kind of magic. The large jars, over a hundred years old, are almost completely buried in the shade of trees, which helps keep the wine’s temperature always around 14°C in the summer, and prevents them from freezing during the winter. For the first month the wine ferments on its lees without the addition of yeasts, and then remains in the amphorae for aging. Having seen how all this takes place so naturally, outdoors, with minimal human intervention, it seems incredible that the end result is so excellent. 05.10.2015. 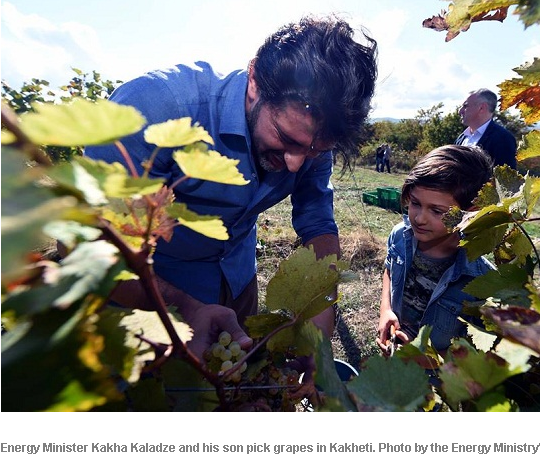 Georgia’s Prime Minister and other members of the Cabinet together with their children have participated in grape harvesting in the country’s leading wine-producing region. PM Garibashvili, his two sons, Vice PM and Energy Minister Kakha Kaladze, his son and other officials with their families went to the Kakheti region to pick grapes together with local farmers as Georgia celebrated the National Wine Day today. "Since our team is in power more than four hectares of new vineyards have been created in our country,” the PM said. Garibashvili also said in Kakheti farmers received about 300 million GEL as they sold grapes during the past three years. 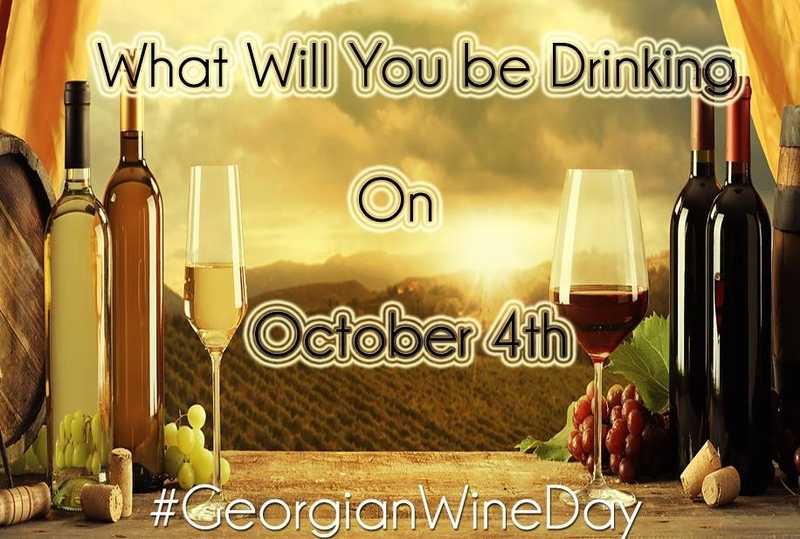 October 4 is the Georgian Wine Day. The country honours its national drink with various celebrations in different regions. Hvino Mapping project launched on Georgian Wine Day! 04.10.2015. Greetings to all friends of Georgian wine! To mark the Georgian Wine Day, today Hvino is starting our Georgian wine mapping project. Hvino Map is an experimental project, where users are mapping the important wine places of Georgia. Hvino Map is already fully usable. It will be updated every week, becoming richer and more comprehensive with time. It can be used on any desktop or mobile devices, both Apple and Android. Direct link to map is here. You are welcome to add a new object, such as winery, cellar, wine shop, hotel or other place useful for visitors. Users also may update and correct locations if necessary. If you want to edit the map, see instructions in the bottom. Also please report us about all problems or bugs, so we will fix them. To edit the map, see instructions in the bottom. 04.10.2017 (Hvino News). Kakheti, a region in the eastern part of Georgia, hosts the 2015 Wine Festival on October 4th. Today also the Day of Georgian Wine is being celebrated throughout the country, established at an initiative of the country’s Prime Minister Irakli Garibashvili in 2014. Visitors can enjoy traditional arts and crafts, such as ceramics, textiles, Georgian dance and folk music. The festival is organized by the Kakheti Wine Guild and the National Wine Agency of Georgia. Are you ready for National Wine Day? 01.10.2015. Georgian National Wine Day will see events in eight cities, including capital Tbilisi and Georgia’s eastern winemaking region Kakheti, mark national wine culture. The festivities will commence at Rose Revolution Square (near Radisson Blu Iveria Hotel) with the opening of the Centre for Georgian Wine, which includes a dedicated museum for Georgian traditional winemaking tools and items. The occasion will also see winemakers welcome guests to sample traditional Georgian wine, and exhibition of paintings, photographs, traditional items and wine products. The highlight of the capital city’s festival will be a celebratory march featuring hundreds of volunteers through the Square and nearby area. Tourists arriving on late flights at Tbilisi International Airport on October 3 will be welcomed with souvenirs related to the celebration at passport control, while restaurants and hotels participating in Georgian National Wine Day will have special corners and gifts for visitors. 01.10.2015. By September 28, Georgia had exported 23.3 million bottles of wine so far in 2015. 3.5 million bottles were exported in September, according to the Agriculture Ministry; the highest monthly rate in 2015. The export of wine has tripled, compared to the beginning of the year. Agriculture Minister Otar Danelia said Tuesday at a briefing that the top export countries are Russia with 12.1 million bottles, Kazakhstan 3.4 million bottles, Ukraine 1.9 million, China 1.4 million and Poland 1.1 million. Since January, the wine has been more strictly examined, Danelia said. 343 samples have been inspected in Tbilisi and other areas of Georgia. There were 17 suspicious cases that were sent for further analysis. 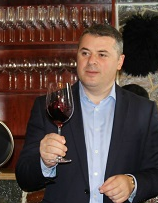 He outlined that the government has spent more than 10 million laris on marketing Georgian wine and stressed that it would be better if wine producers could be more active in this way themselves. “In the beginning, a fifth of this was spent on marketing. I think even the current amount is not enough, because we have new market opportunities,” he added.